A US Black Hawk helicopter has crashed outside a US military base near Saddam Hussein's hometown of Tikrit, killing all six soldiers on board. The American army is investigating whether the chopper was attacked or suffered mechanical problems. 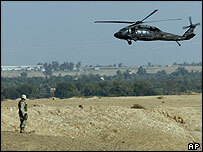 US troops have secured the crash scene near the Tigris River in northern Iraq. Last weekend, a Chinook helicopter was shot down, killing 16 soldiers in the biggest single strike on US forces since they invaded Iraq. The Black Hawk went down on a riverbank along the Tigris River about a kilometre from the US base in Saddam Hussein's former palace in Tikrit. "We don't know if it was a mechanical failure or hostile fire," said US Major Josslyn Aberle. She said officials were looking into reports that loud booms were heard just before the Black Hawk went down. Some American soldiers have been reported as saying the helicopter was probably shot by a rocket-propelled grenade. US helicopters could be seen flying over the scene hours later, scouring the area for possible attackers, while US tanks, Humvees and infantry took up positions around the site. 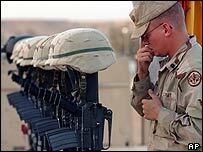 All the soldiers killed were from the 101st Airborne Division. If confirmed, it would be the third American helicopter to be brought down in two weeks. As well as the attack on the Chinook, another Black Hawk helicopter was shot down near Tikrit on 25 October, injuring one crew member. Tikrit lies in the heart of the "Sunni Triangle" - the region around Baghdad seen as most loyal to the ousted regime of Saddam Hussein. It has been the scene of continued resistance to US-led forces. Residents watched the smoke rise from the wreckage, barely hiding their glee, the French news agency AFP reported. "I saw one of the helicopters shot from the side and I saw smoke and a ball of fire. I felt happy and started shouting 'God is great'," 19-year-old Saqr Ghani told the news agency. In continuing violence, two American soldiers have been killed within the last 24 hours in Mosul. One died and six were injured when their convoy was ambushed early on Friday, the US Army said. A soldier from the same division - the 101st Airborne - was killed by a roadside bomb on Thursday. Mosul, Iraq's third largest city and close to the semi-autonomous Kurdish areas which border Turkey, was quiet until relatively recently. Correspondents say there is concern among US commanders that guerrilla attacks are spreading north from the Sunni Triangle. In a blow for the Bush administration, a Turkish Government official says Ankara has decided not to implement last month's decision to send troops to Iraq. Washington is trying to build up an international force to help shoulder the burden of patrolling and stabilising the country. Poland, which heads a 9,000-strong multinational force across a large area of central and southern Iraq, lost its first soldier in an attack on a military convoy on Thursday. The attack on the Black Hawk came a day after a memorial service was held for the soldiers killed when their Chinook helicopter was shot down on Sunday. "Death was in the cause of freedom. They were serving our country and answering our nation's call to fight terrorists," Colonel David Teeples, commanding officer of the men's unit, said. Army officials said the Chinook's crew apparently had a warning of an approaching missile seconds before it struck, the Associated Press reports. The crew managed to launch flares designed to draw the heat-seeking missile away but the defensive measure did not work. "Choppers are crucial for moving soldiers and hunting down the enemy"